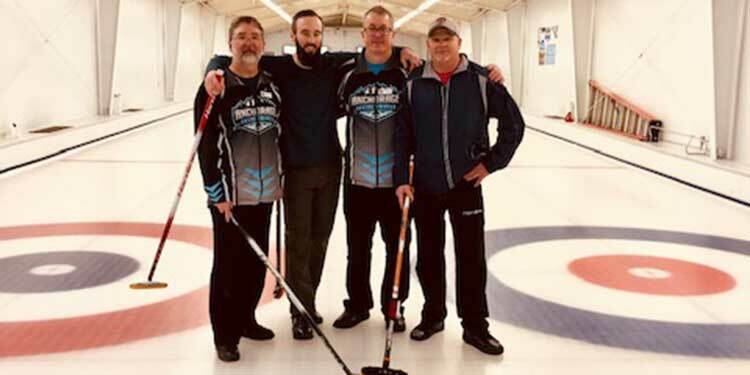 From left, the 2019 Alaska men’s entry at the Pacific International Cup: Skip Desaulniers, Tony Hubbard, George Newman and Levi Piehl. Missing: fifth Dan Bogan. Alaska maintains a special place in the history of the Pacific International Cup. When organizers decided after the success of the inaugural club championship in 1999 (which was limited to B.C. curlers) to extend the event by creating an international competition, Alaska was one of the first to step forward. The state has been represented ever since at the PIC, which is celebrating its 20th anniversary April 17 to 21 at the Richmond Curling Club. This year’s Alaska men’s team itself has a lengthy and proud connection with the event. This will be third Levi Piehl’s third trip to the PIC. And his wife, Michelle, was a sportsmanship winner at the 2012 PIC. Born and raised in North Dakota, Piehl learned to curl at the Minot club in the mid-90s. He moved to Alaska in 2001 and has been curling out of Anchorage ever since. Perhaps one day their daughter, Eva, will also grace the PIC ice. Transplanted Canadian George Newman, originally from Calgary, is skipping this year’s team. A veteran of the curling wars, Newman has been playing for almost 40 years; the last three out of the Anchorage club. A keen sportsman who enjoys skiing, hiking and experience the great outdoors of Alaska, he is married to an equally lifelong curler in wife Donna, who has played the sport for 30 years. Lead Skip Desaulniers is also a transplanted Albertan, originally from St. Paul. He began curling in 1971 and is married to another lifelong curler in wife Debbie. The couple is in the midst of moving to Phoenix, where they anticipate continuing to curl. Tony Hubbard, who moved to Alaska from Oregon in 2009, credits curling with forging many “incredible” friendships. Dan Bogan is the fifth player on the team. While Alaska is still looking for their first men’s title, while Alaska won the women’s PIC championship in 2014 and the international pool in 2016.